Pringle Creek Community is a one of a kind neighborhood, and we are excited to let you know that a very special and unique home has just become available. Like that special someone who only comes around once in a blue moon, the Net Zero home is sure to take your breath away. This unique 4-bedroom and 2.5 bath home has a master on the main with plenty of natural light, as well as a beautiful courtyard that’s ideal for entertaining guests. When we think of the one, this one is the home that checks all the boxes. Taking even a closer look as to what makes the Net Zero home super energy efficient is it’s construction. It’s made out of ICF, which stands for insulated concrete forms. Essentially, 100% recycled polystyrene blocks are put up like you might think of Legos. They are connected together, and then concrete is poured in between them to make a form that provides a very tight building insulation envelope. This means, your energy bills will be significantly less, because it takes less energy to heat and cool the home. 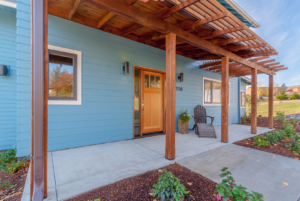 This home exhibits expert craftsmanship thanks to Better Builders of Oregon‘s expertise in building with ICF for over 25 years. Zooming back out, Pringle Creek Community also has wonderful amenities for its residents, like the first LEED Platinum community center in the nation along with a flourishing urban farm. Residents can choose to have indoor and outdoor gardening plots, or just stop and smell the roses while picking up an extra sprig of rosemary to liven things up. The dedicated green space expands beyond the urban farm’s green houses to the meadows, orchards and spills into the serene namesake Pringle Creek. 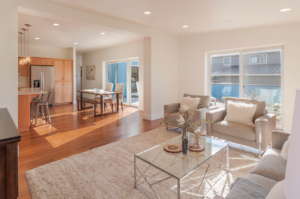 As you can see, the Net Zero home is such a unique opportunity that doesn’t come along too often. Don’t miss out on this special home situated in an urban oasis.